Every time it rains there is a potential for flooding to occur. This is especially true after major storms. It’s also common in the spring when snow melts at higher elevations, causing mountainous streams to surge. As water from rain storms and snow melt collects in larger rivers, it raises the water level. The greater the amount of water that enters a river, the higher the level can become, and the greater the risk of a major flood event. Each year, it is estimated that on average 133 lives are lost and over $4 billion in damages to homes, businesses, bridges and other infrastructure occurs due to inland flooding from rivers. (Coastal flooding from storm surge causes even more damage.) To help save lives and minimize damage, the National Weather Service regularly forecasts the potential for inland flooding around the country. The National Weather Services’ Advanced Hydrologic Prediction Service (AHPS) analyzes data from over 5,000 stream gauges (many of which are operated by the USGS), and combines that data with numerical models to issue daily as well as long-range forecasts of the potential for flooding to occur. The main page of the AHPS website displays a map of all of the active stream gages in the country. 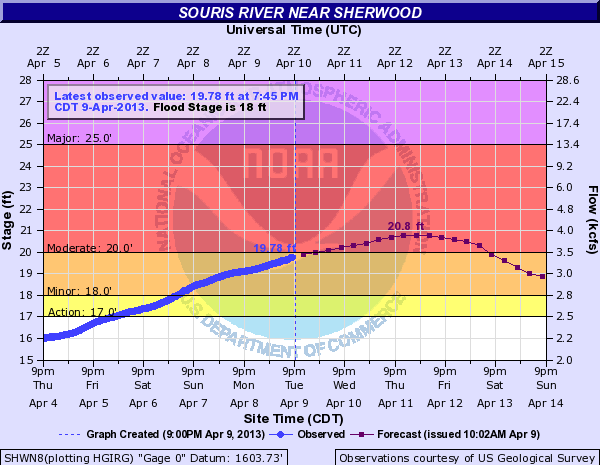 Each point is colored based on the current water level. Oranges and reds signify rivers with high water levels where flooding may be occurring, while greens indicate rivers that are currently at normal levels. The AHPS forecast map (see above) displays a subset of stations where forecasts are available. On this map, dots are colored based on the potential for flooding to occur during the next 48 hours. You can click on each point to see a graph of the river’s water level over the last 2 days, as well as the forecasted level over the next two days. Lines on each graph show the water levels where, based on past observations, minor or major flooding is likely to occur and cause damage. These graphs are updated regularly. During a major storm event, you will often see the forecast lines change over time as new data comes in and more accurate predictions can be made. 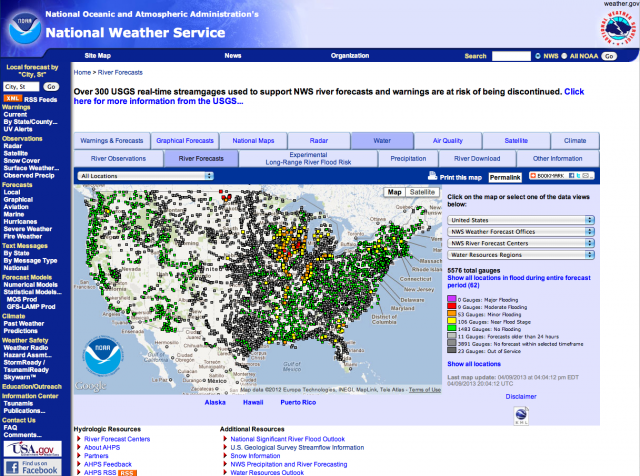 Educator Tip: The AHPS river forecast website provides great way to introduce students to flood monitoring and forecasting. Students can investigate the real-time conditions at rivers in their local area or across the country to see where floods might occur. The national maps of real-time and forecasted flooding provides a great overview of conditions across the country, and students can easily compare these maps with weather radar data to investigate the correlation of rainfall with potential flooding. It’s April. And while the cold temperatures here in New Jersey make it feel like spring hasn’t quite yet arrived, the flowers are starting to poke through the ground, reminding us that spring is coming, and with it, a steady stream of springtime showers should be on their way. Of course, when rain falls on land, much of it ends up in rivers and streams. And thanks to a network of over 3,000 stream gages monitored by the U.S. Geological Survey, we can easily study how precipitation, including rain and snow, impacts local streams, rivers and estuaries. 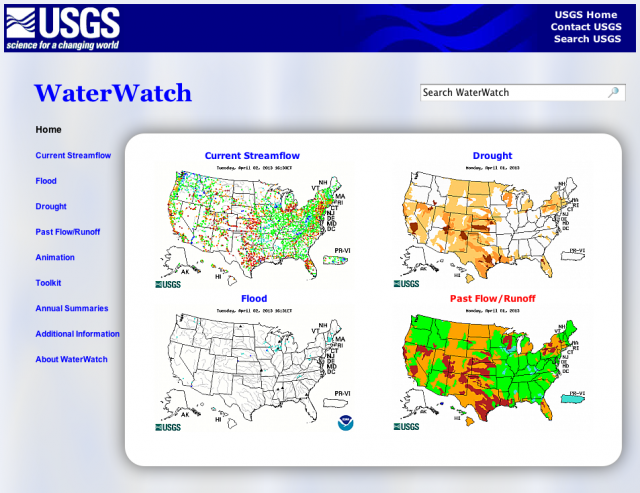 All of this data is available on USGS’s WaterWatch web site, which features several easy to use maps, providing a great way to introduce streamflow data to students and the public, while showcasing how it can be used to monitor floods and droughts – critical issues related to human health, safety and well-being. Here are a few great places to start. Current Streamflow Map: This map displays the real-time conditions from all of the streamflow stations across the country. Some stations measure streamflow discharge or flow rate, while other stations measure gage height, that is, how high the water level is. A few stations even measure other things like temperature, pH and dissolved oxygen. From this map, you can select an individual station to view in detail, access raw data or create custom graphs. On the map, each station is represented as a colored dot, whose color is based on how the current streamflow or gage height compares with past records. Reds designate those stations that are below average while blues are above average, and green dots represent those stations that are in line with historical norms. You can also view historical streamflow maps. Flood Map: Sometimes, you can have too much of a good thing. This map shows those stations stations that are currently reporting conditions drastically higher than their historically normal levels. This can often happen after severe storms with large amounts of precipitation (which is especially true after tropical storms and hurricanes), but it is also common in the spring when mountain snowpack melts. And of course, some rivers are susceptible to a springtime a double whammy. Personally, I’ve always wondered if a more appropriate phrase for this time of year might be “April flowers bring May showers,” but to make that case, I need to dig through this data some more. It is often said in Pennsylvania that March comes in like a lion and goes out like a lamb. And while this March felt more like a ride on an Arctic roller-coaster that wouldn’t end, the good news is that, based on past years, we should soon be on the downward slope towards more calmer weather. In the Mid-Atlantic, the winter months usually bring with them strong storms and high winds, like the nor’easter we saw earlier this month. 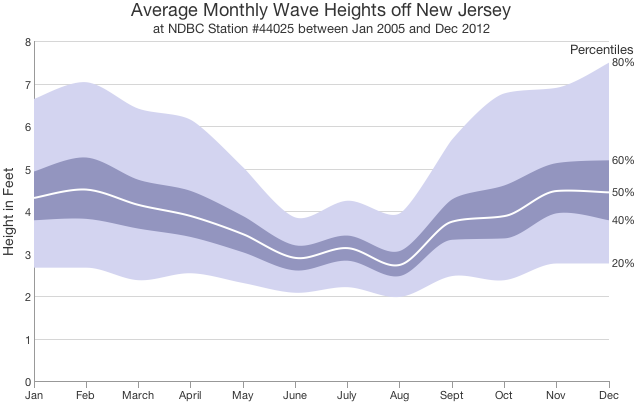 In the ocean, strong winds lead to larger significant wave heights, as can be seen in the graph above that depicts the average monthly wave heights off the coast of New Jersey over the course of a year. 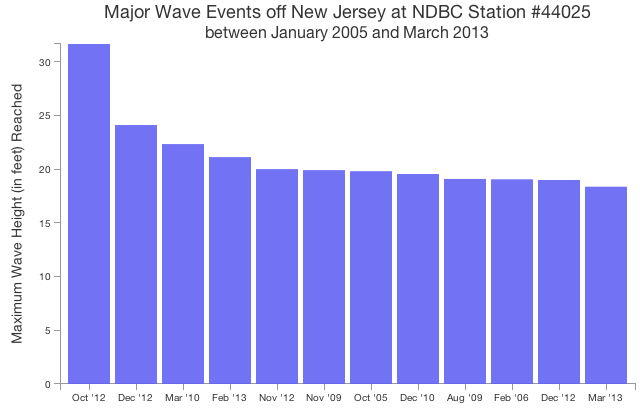 This graph was created using 8 years of significant wave height data from NDBC Buoy 44025, which is a little more than 40 miles from the New Jersey coast. Each line represents a particular percentile level, indicating the percentage of measurements that fall below the indicated level. The 50% percentile level is commonly called the median average value. For each month, half of the measured data over the course of the 8 years fell above the median value while the other half fell below. This graph shows a distinct difference between the seasons. The median wave height in December, January and February is around 4.5 feet, while in the summer months of June, July and August, the average is closer to 3 feet. While the median value is higher in winter months than summer ones, the change is even larger for the 80th percentile line. For that, we can thank those large winter storm events that turn the ocean into one rough ride. Thankfully, spring will soon give way to summer, and if the past averages hold true, the summer months of this roller-coaster should include calmer waters. In ocean education, it’s often a challenge to convey how humans and the ocean are connected. One good place to start is where people live. By highlighting how many people live at or near the coast, the potential impact the ocean and humans have on each other becomes significant, and a stronger case for relevance can be made. 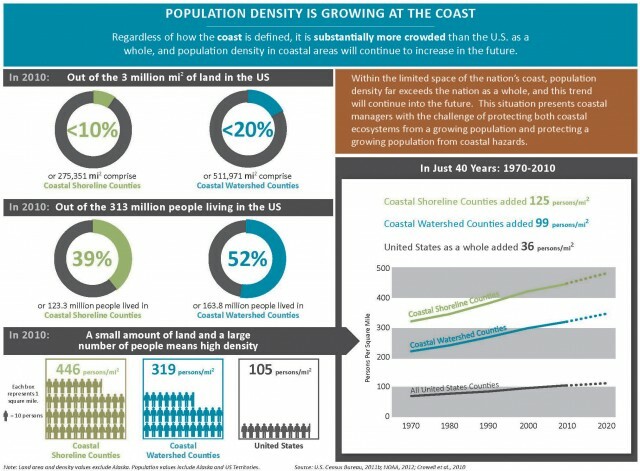 NOAA and the U.S. Census recently released the National Coastal Population Report which analyzes population trends in coastal counties over the past 40 years, and includes forecasts for 2020. In 2010, 39% of the U.S. population lived in coastal “shoreline” counties, comprising less than 10% of the land area of the continental United States. Over half of the U.S. population (52%) lives in counties whose watersheds drain directly to the cost, comprising 20% of the U.S.
Shoreline counties have slightly higher percentages of people with Bachelor’s degrees and higher, as well as households making over $75,000, than inland counties. New Jersey has the 4th highest number of seasonal housing units in shoreline counties, following Florida (no suprise there), Michigan (thanks to the Great Lakes) and New York. However, Maine has the highest percentage of seasonal housing units, followed by the Carolinas and Minnesota. New Jersey ranks 4th in population and 5th in population density when only shoreline counties are taken into account. This reflects the fact that while most of NJ is coastal, other states like Illinois, Pennsylvania, and Massachusetts (which have lower overall densities) have populations concentrated in their coastal towns. If you’re an educator, this report might be a useful starting point for fostering discussions on the relation between humans and the ocean. Overall, the report is quite accessible with a good variety of clear graphs and maps. It also eschews lengthly analyses, leaving the interpretation to the reader, while providing some helpful highlights in the sidebars. 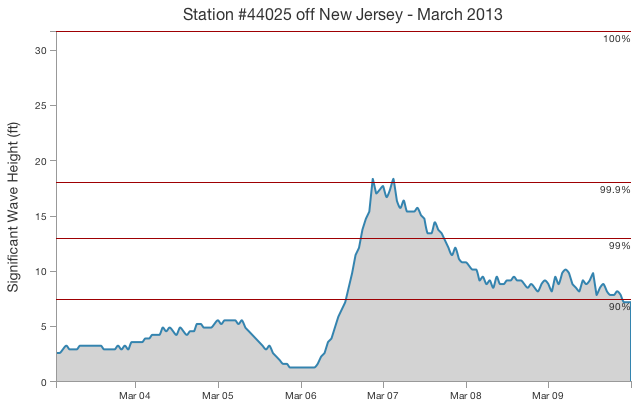 It has been a rough winter in New Jersey, especially on the coast. First, Post Tropical Storm Sandy struck Atlantic County on October 29th 2012, becoming the costliest natural disaster in New Jersey’s history. Over the next 5 months, several additional strong storms made their way across the state, bringing with them heavy winds, coastal and inland flooding and significant snowfalls. 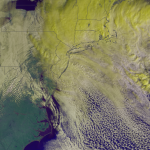 Strong storms, many of which are called Nor’easters, are common occurrences in the Mid-Atlantic during winter months. Their strong winds also lead to high waves in the ocean. But this past winter was rather exceptional. The above graph shows an analysis of wave heights measured by NDBC Station 44025. Each bar depicts the maximum wave height reached for each of the 12 largest events (each lasting 2-3 days) recorded over the past eight years (from January 2005 to today). Of the 12 events with the highest waves, 6 of them have been in the last 6 months. 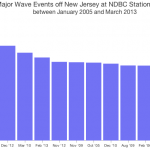 The largest recorded wave event was, of course, due to Sandy. The 12th largest occurred during the nor’easter that struck earlier this month. It’s important to note that this does not (yet) represent a significant trend. Taking the top 20 events into account, only the same 6 events occurred this winter. 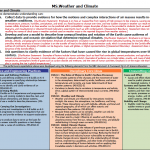 Extreme events can often occur in spurts, triggered by prevailing climatic conditions, so the likelihood of many major events coinciding is not uncommon. In addition, an 8-year dataset is far too limited to make any assumptions about long-term climate changes. However, it should be quite clear from this evidence that New Jersey residents are certainly ready for Spring, and more importantly, calmer weather. Every day, the National Weather Service issues countless official forecasts and warnings, relying on a large network of land and ocean sensors to provide up-to-the-minute observations of the weather around the world. The accuracy of these forecasts depends largely on having enough data collected from the right places, all transmitted back to the forecaster in a timely manner. While it’s relatively easy to set up an instrument station on land and communicate with it, it’s far more difficult to do so in the ocean. 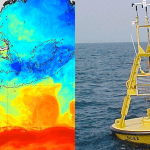 To meet this need, NOAA’s National Data Buoy Center is tasked with operating and maintaining a global network of over 250 buoys and shore stations that collect and relay (via satellite) real-time data on atmospheric and ocean conditions. 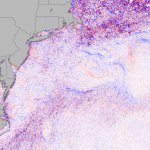 As if that wasn’t enough, NDBC also collects and processes data from over 850 additional stations run by a number of collaborators, including the National Ocean Service, the Integrated Ocean Observing System and even the oil and gas industry. Most importantly, NDBC provides their data to the world to use, for free. Their site may not be pretty, but it is an amazing resource for atmospheric and ocean data, (they even include a lot of background information) and it is an essential resource for oceanographers who need weather data to provide context to their experiments. From the NDBC homepage, you can quickly navigate to any region of the world that you might be interested in. Clicking on any buoy or land station brings up the most recent real-time observations from that station, as well as links to additional information on the station (including 5-day graphs of each variable), and a full archive of data. The archived data files are relatively easy to use (though they do take some massaging – more on that soon), and they provide a virtual treasure trove of information to explore. As someone who is interested in data about the natural world, and in particular about the ocean, I often find myself on the NDBC site. 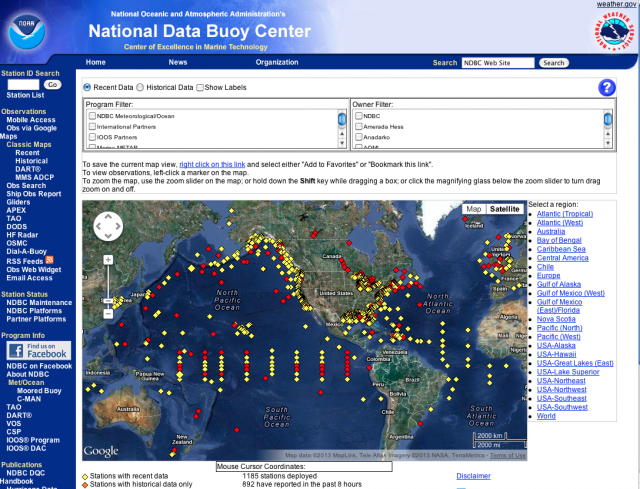 Whether you want to investigate physical processes like the correlation between winds and waves or between air and water temperatures, or study the differences and similarities between two locations, or review the events that occurred during past storms, the wealth of data on the buoy center’s site is sure to keep you busy for a long time. If you have a favorite research subject or activity that you utilize NDBC data for, I’d love to hear about it. Please leave a note in the comments, or contact me. Last week a major snowstorm travelled across the continental United states, becoming a strong nor’easter over the Mid-Atlantic. While snowfall amounts in New Jersey were far less than some had predicted, the wind and waves that battered the coast were still quite severe. Dunes in Mantoloking, NJ that were heavily damaged last fall by Hurricane Sandy were again breached, causing flooding and further hindering repairs. Wave heights at NOAA Station 44025, just 43 miles off the coast of New Jersey, reached 18.4 feet on the night of March 6th. The blue line above shows the significant wave heights measured by the NOAA buoy over the course of the last week. The red horizontal lines signify the percentage of hourly wave measurements recorded between 2005 and 2012 that were less than the indicated height. The top line, at 31.6 feet, represents the maximum wave height reached during the 8-year record, which occurred as Hurricane Sandy made landfall. The maximum wave height during last week’s storm reached the 99.9th percentile. Only 1 hourly measurement in 1000 hours of measurements (the equivalent of 42 days) ever reach this level. After the peak, wave heights remained between the 90 and 99.9th percentile for 3 days, which indicates the significance of this storm. Matlab tip: If you’re interested in calculating significant wave heights at various percentile levels at other stations or for other parameters, here’s some code to play with. The Earth Observatory is a great exemplar of what a public portal can be. 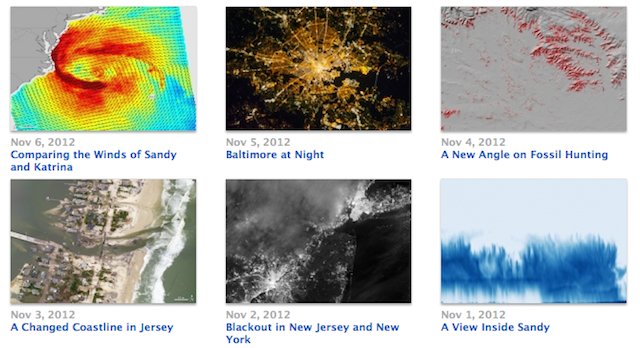 It combines a number of really cool features like an Image of the Day, a Natural Hazards archive, global maps of data, and an awesome collection of feature articles. Indeed, there are quite a few image-of-the-some-specified-period sites out there, but none has quite the caché of the Earth Observatory. Of course, no other site has quite the same level of resources behind it either (I’ve heard estimates that Earth Observatory has upwards of 70* people involved), but that doesn’t mean we can’t learn from their experience while aspiring to model the site in our own work. 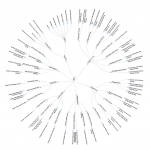 To me, the site is successful because it effectively melds visualizations and text into compelling stories. 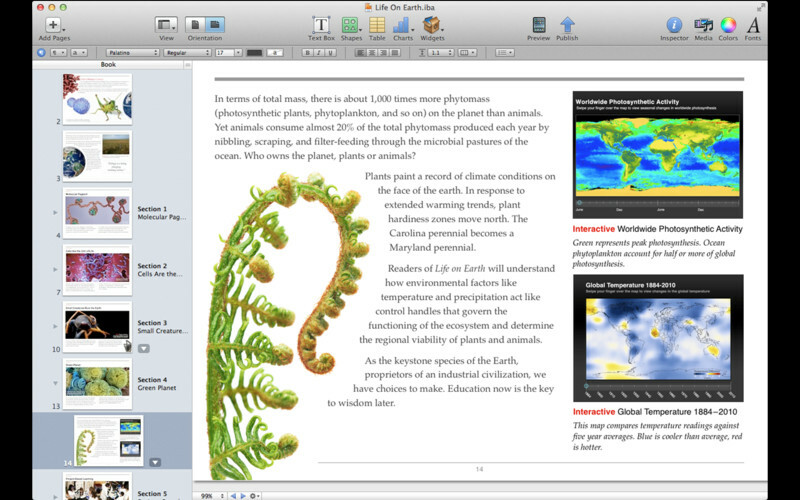 The visualizations are effective, clear and demonstrative of best practices in almost every case (and I hope to highlight this in future posts), but while the engaging appeal of the visualizations, images and photos may lead readers in, it is up to the text to tell the full story, imparting knowledge upon the reader. A few years ago, the text of many of the daily images was almost formulaic in nature. And while proscribed formulas rarely lead to effective prose, those entries were still of interest because they covered three elements essential to conveying the story shown by the visualizations. What event or subject does the visualization relate to? What does the visualization show, and how can one read and interpret it? How was the data collected and visualized? 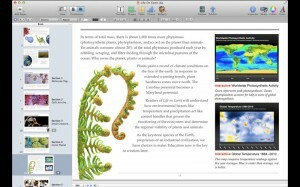 In other words, what is the relevance, story and science behind the visualization. The key point here is that Earth Observatory follows a traditionally journalistic flow in their narratives. They grab a reader’s attention by starting each story with why they should care about the subject at hand. This is then followed with details on the image and relevant science. A reader is a lot more likely to appreciate and understand an image of flooding if they know how much damage it caused. Unfortunately, scientists who attempt to push their research out into the public realm often take the reverse approach, leading off with the (far more boring) instrument or dataset, leaving the point of the story to the end, in the fashion of a scientific paper. If you’re interested in visualization generally, developing your skills or learning from the best, I highly recommend subscribing to their weekly email lists. And if we hope to improve how we share our observations and visualizations of Earth’s mysteries with its citizens, than we would be well advised to follow the Earth Observatory model. 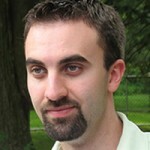 *Update: According to @rsimmon the core team has only 7 members, but they do have a lot of contributors. @nasa_eo @visualocean 9? Only 7 people on the core team. A major winter storm made its way across the continental United States this week, dropping snow across the Dakotas, then the Midwest and the Mid-Atlantic before finally heading out to sea over the Northeast. While snowfall from the storm was difficult to forecast precisely, nonetheless it still caused major damage across many states. 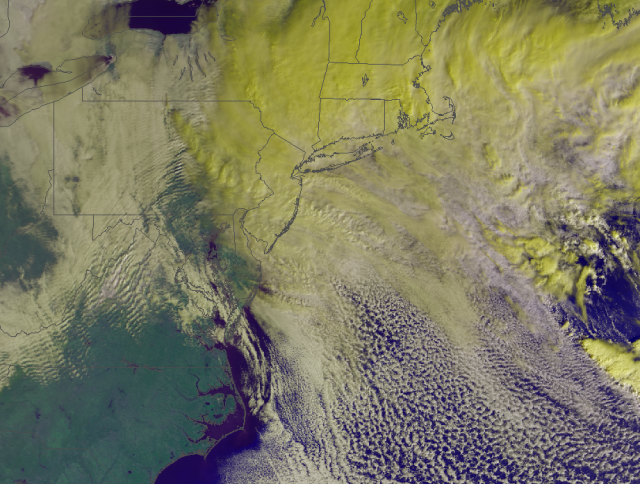 The image above shows what the storm looked like at 9am EST on March 8, 2013, through the false-color eyes of the AVHRR instrument on board satellite NOAA-16. Unfortunately, AVHRR was not designed to measure visible light as many more modern satellites do. It’s primarily used for measuring the surface temperature of land and the ocean. 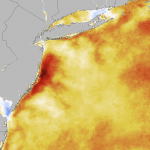 The colors in the above image were approximated with a computer algorithm that converted AVHRR’s red, near-infrared and infrared channels into red, green and blue, creating this non-traditional colorful image of the Mid-Atlantic. While the colors in this image can not be regarded as real, they are still useful. The white clouds are colder and generally higher in the atmosphere, while yellow clouds are slightly warmer and lower. Most of the clouds connected with the storm system are yellow. Storm bands are also visible as semi-circles pushing in towards Massachusetts and on down into New Jersey. This counterclockwise rotation is a common feature of a Nor’easter. In advance of the storm, scientists at Rutgers deployed an underwater glider to measure how the storm will mix sediment in coastal waters. The glider certainly saw a lot of action, as wave heights reached 14 feet at the New York Harbor entrance, 24 feet off the coast of Virginia Beach, and 30 feet at the Hudson Canyon as the storm’s center passed by late on March 6th. Special thanks to Steve Miller at NRL-Monterey for the code used to create this image.